You are currently browsing the category archive for the ‘Technique’ category. The Great One. Buddy Rich. Don’t mess with him. He knows what’s up… buuuuuuut… not so much on his explanation of why traditional grip is superior to match grip. That’s all I hear him saying. Really, Buddy? I can move around the kit better if I use traditional grip? Why though? What about traditional grip let’s you move around the kit better? Oh wait… are you saying that YOU can move around the kit better with traditional grip? Well, sure. Traditional grip is what you use, so I’m not surprised to hear that you’re “better” when you use traditional grip. But why should I use it? Is there something inherently or objectively “better” about the traditional grip? He never quite gets to that part. In other words, he never actually defends or backs up his statement. He just makes a statement. Attention all drummers who wish to sound good in a studio setting: Read this article immediately and don’t try to argue with it. Ok, ok… maybe I will argue with it a little. Clamp the hihats closed? A well-placed slosh hat groove rules and everybody knows it. Don’t use a crash as a ride? If it’s the right crash then riding on it sounds amazing and everybody knows it. But the main point of the article still stands. When Michael Bland first introduced me to this concept it changed my life as a drummer. The following is a very meandering post that will, hopefully, arrive at what I feel is an important point. But you might need to be patient. From where I’m sitting, it seems like the reason kick drum technique is a big deal among drummers is due to an ongoing argument about how to play a bunch of kick drum hits super fast with a single pedal, because apparently playing a bunch of super fast kick drum hits with a single pedal is “awesome” and “technical” and stuff. Regarding that, I would like to humbly suggest that playing lots of fast kick drum notes on a single pedal is NOT necessarily awesome or technical, at least not objectively or inherently. Premise #1 for today’s post is to rethink whether you should even want to play lots of fast kick drum notes. Meaning, will the music you’re playing be improved as a whole if you add lots of fast kick drum notes? If so, then does it really matter if a single pedal is used to play them instead of a double pedal? If you’re answer is “yes” to either of these questions and you’re not shooting a video for gospelchops.com then you should really reconsider. Disclaimer: Once again let me reiterate that I’m speaking from my own experiences here – what playing drums for twenty years has taught me. Feel free to disagree, especially if you’ve had experiences that contradict what I’m saying. Now then… premise #1 is that lots of super fast kick drum notes on a single pedal doesn’t automatically get you any extra cool points. Perhaps if those fast kick drum notes were appropriate and fitting for the song, and if the notes were played right in the pocket with clean execution… well, then that’s great. But I find those circumstances to be pretty rare. I’m moving on to premise #2 now, which is that TWO kick drum notes in quick succession (not lots of notes – only two) is a very useful component throughout many styles of drumming. Clarification on premise #2: “Quick succession” for two kick drum notes is defined as any two notes that require a special technique to play because they are so close together. Think back to the heel-up technique from my first kick drum post. Normal heel-up kick technique means that every note has an upward motion of the leg to prepare for the stroke, and then a downward motion to execute the stroke (you can see when a drummer is doing this because the knee is visibly moving up and down for every note played). So, if a drummer is wanting to play two kick drum notes in a row, and in order to facilitate this the drummer needs to do something technique-wise other than the standard heel-up motion, then I would say that those kick drum notes are happening in “quick succession.” In my private lessons I call these notes “doubles”… two kick drum hits in quick succession that require an alternative technique to heel-up. “Singles” are notes that are played each with the standard heel-up technique. So a drummer can play either “singles” or “doubles” on the kick drum. Again, let me reiterate what I said at the beginning… I’m NOT talking about more than two notes in quick succession. I basically don’t care about that. And I’m also not talking about using a double kick pedal. I’m currently discussing the situation where a drummer wants to play ONLY two notes in a row, and I’m suggesting that there are two ways to do this: Play “singles” (because the two notes are far enough from each other that the standard heel-up technique can be used for each one), or play “doubles” (because the two notes are so close together that some other technique must be used to pull off both notes). You’ll notice that I’m saying that doubles involve “some other technique” than heel-up, and that particular wording is intentionally vague because today’s post isn’t meant to point you toward a specific doubles technique. I don’t really care too much about that. I have one that I use, and it works great, but I’m sure there are other equally helpful techniques for doubles. Ok. Onward to premise #3 (the real reason for this post): If a drummer spends enough time working on the heel-up “singles” technique, a doubles technique may never be needed at all. This is obviously fanciful thinking, but it’s at least logically true. Imagine that I spend a ton of time practicing my singles technique – always playing notes in pairs with individual heel-up leg motions for each note – and regularly push myself to get better and stronger and faster at this. The way I defined “doubles” above (two kick drums so close that they need a technique besides heel-up) implies that the heel-up technique can’t adequately cover your two kick drums notes if they’re played at a certain bpm or higher. But a drummer can always raise a bpm ceiling by practicing. SOOOO… at least in theory… if someone had a strong enough “singles” technique (where any and all kick hits, regardless of whether they’re alone or in pairs on in a sequence of 7 notes or something, are always played with a strong heel-up technique), then that person would never reach a bpm ceiling and therefore never need a doubles technique. This would require immense work/effort/practice, but it is within the realm of being possible. Like I said, it’s somewhat unrealistic to think that a “doubles” technique would NEVER be needed because your singles technique is so amazing. But why not at least work toward that? Why not try to relegate your doubles technique to something that you only need every once in a while? Again, I’m speaking from experience here. I did this in college, back in my heavy practicing days. I just sat there and cranked out 16th notes on my kick drum (with quarters on the hats and backbeats on the snare… like a huge 16-on-the-floor groove) for HOURS and HOURS until my thigh just burned. Then I would stand up and walk around and get the blood flowing and go do it again. As a result, at this point I truly don’t need my doubles technique very often at all. SUMMARY: Consider the possibility that practicing your singles technique (playing lots of kick notes, each with individual heel-up motions on the leg) is your best and most productive way to strengthen your kick foot, rather than spending time on whatever your doubles technique is. I recently began a series of posts on the “controversial” (tongue-in-cheek) topic of kick drum technique, the first of which was about playing “heel up” strokes with the kick drum foot. Part 2 of my kick posts revolves around what you do with your kick pedal AFTER playing a stroke. This technique is directly linked to heel-up, so if you aren’t a heel-up guy then no need to read further. In short, “burying the beater” means continuing to press the part of the kick pedal that touches the drumhead (the beater) into the drumhead after the stroke happens, instead of rebounding right away. This technique is the opposite of how one would hit a rack tom with a stick, where pressing the stick into the drumhead after the stroke would deaden the sustain of the stroke. It’s this “deadening” of the sustain of the kick drum that makes burying the beater an appealing technique. The tone of the kick is slightly different when burying the beater than when not, and most engineers (live and studio) prefer the “buried” tone. The pressure required to keep the beater pushed against the drumhead after a stroke is the reason burying the beater is so closely linked to the “heel-up” technique. Keeping the beater buried with heel down is quite a strain on the ankle, but the natural weight of the raised leg can easily keep the pedal in down position. – The beater, when buried into the kick head, leaves the pedal spring fully stretched and ready to fling back. If, while burying the beater, the foot is lifted suddenly off the pedal, then the taught spring will burst back not only to the natural stand-still position, but even FURTHER the other direction. – The volume of your kick stroke is directly related to the velocity of the beater as it approaches the drum head. Additionally, the velocity of the beater is directly related to how large the distance is between the kick head and where the beater starts moving toward the kick head. – The bottom line: I leave the beater buried into the drumhead until the last moment before I want to produce another stroke. Then, as I suddenly lift my foot to prepare for the stroke (heel-up style), the pedal flings back maybe 8 inches away from the kick head – instead of the 5-inch distance that the beater sits at while in a normal standstill position. This requires careful timing, but stomping on the pedal while it’s flung way back (from the released spring tension) means that I get a much more powerful kick stroke. – Last thing: The pressure required to keep the beater pushed against the drumhead after a stroke is the reason burying the beater is so closely linked to the “heel-up” technique. Keeping the beater buried with heel down is quite a strain on the ankle, but the natural weight of the raised leg can easily keep the pedal in down position. SUMMARY: Don’t be afraid of the tone that comes from burying the kick beater into the kick head. It brings a ton of additional power and tone. This is a somewhat wordy explanation, but if you’re grasping what I’m saying and you spend some time working with it you should see a much stronger kick stroke in your playing. 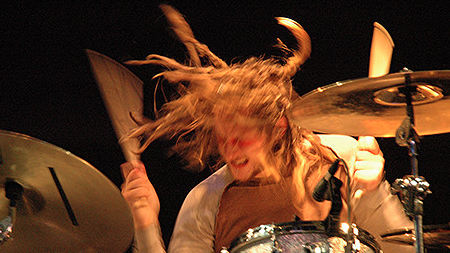 Drummers are PASSIONATE about kick drums. I mean, wow. Technique, dimensions, pedal choice, head choice… there are so many forums and articles on the topic, often containing really heated rhetoric. So, let me start off this series of posts about kick technique with a disclaimer: I DON’T THINK I’M RIGHT. I’m not suggesting that my way of doing things is the one and only correct way. Please feel free to disagree with me. The only thing I’m trying to convey is that my personal kick technique, which I’ve developed over my years of playing, seems to work really well. Not only does it work well for me, but it has worked well for my students. And I think it might work for others too. So I’m sharing it. I want to begin in the rock world – in what I think of as playing in a power environment. By “power environment” I’m referring to any musical context where the drums are bringing a backbeat (snare on “2” and “4”) in a way that dominates the groove of the song. This includes pop, rock, country, hip hop, punk, metal, and others. Jazz, on the other hand, is not normally thought of as a power environment, because in that genre the drumset has a more subdued and nuanced dynamic. Folk is another example of a style I would not consider to be a power environment. Additionally, any of the styles I listed above as being power environments could easily become NOT so, if the physical room that one performs in is too small or boomy or whatever (I’m thinking here of churches or wedding receptions or any other situation where one would play rock grooves quietly). Sorry for all the disclaimers, but… just in the name of clarity… the technique I’m suggesting in today’s post is ONLY for loud and forceful playing in a power environment. Got it? Ok. Today’s post is about playing the kick drum with a “heel-up” technique. This means holding one’s leg (knee, calf, etc) slightly in the air so that one’s heel is not touching the kick pedal. Then, when preparing for a kick stroke, the entire leg (knee, calf, etc) is lifted even higher, such that the entire foot rises almost entirely off of the pedal. The stroke itself comes from the lowering of the entire leg in a sort of stomp, bringing the foot back down onto the pedal with the thrust of the entire leg behind it. I’m using the word “entire” over and over because the technique really hinges on the WHOLE leg being involved, rather than just the ankle. The source of power in this technique should be obvious, and it far exceeds the power offered by a “heel-down” technique. The heel-down technique involves keeping all parts of the foot on the pedal, with both toe and heel touching the foot plate. When preparing for a kick stroke, the heel remains on the foot plate while the foot itself is pulled up using the ankle. The stroke comes from the foot returning to the foot plate (again using the ankle), and all the while the heel has remained on the foot plate. The basic difference between “heel-up” and “heel-down” techniques can best be understood as the difference between tapping one’s foot and stomping one’s foot. A tap involves just the ankle and a stomp involves the whole leg. The power difference should be obvious, and the tone difference that results is a MAJOR factor in the feel of the groove. Power environments needs a powerful sound from the drummer, which is where most of the DNA of a power environment comes from in the first place. The more powerful your stroke on the kick drum, the more air will be pushed through it, and the more air being pushed through the kick drum, the more powerful the sound. Now, there are some guys that I’ve seen who can play with surprising power using only a heel-down technique. This is not the norm, but it certainly exists. My hat is off to those dudes, but I would argue that those guys would get even MORE power if they would use a heel-up technique. It seems like physics doesn’t allow a tap to be stronger than a stomp, even if one’s tap is abnormally strong. 1) There is no need to raise your leg higher than a couple inches while preparing for a heel-up technique kick stroke, and the technique definitely involves the ankle is its own way (more on that in the next kick technique post). So don’t go overboard in lifting your leg higher than necessary or locking your ankle. 2) The contact point on the foot plate should be the “pad” of your foot (the base of the toes). While seated, try to lift both your toes AND your heel up off the ground slightly, while still touching some part of your foot to the floor. That part that’s still touching is the pad of your foot, and that’s where I make contact with the foot plate on a heel-up stroke, as opposed to using the toes themselves as the contact point. 3) I personally use heel-down technique all the time, but only in quieter environments. So again, don’t go overboard in thinking that heel-up is the ONLY way to do things. SUMMARY: Learn to play the kick drum with heel-up technique. This will take time if it’s a new technique to you, but the power will be worth it. Identify if the situation you’re in is a power environment, and if it is, get your heel up technique in the game. Now, these sticking strokes, as far as I’m concerned, are immensely important. But pay attention to this statement: one CANNOT really play music and simultaneously give cognitive attention to technical things like this. The collision of this reality with the importance of technique/rudimental issues is a place where a massive disconnect lives in many musicians. Probably the most important thing Dave King taught me was to know my rudiments and technique, and know them well – and in fact know and trust them so deeply that I no longer relate to them on a conscious level. I speak about this in my clinics and private lessons regularly, and I’ll probably discuss it a little on the 19th. The gist of it is this: When I drive a manual transmission car, I don’t want working the stick shift and clutch to require my focus. I need to focus on the road, traffic, my speed, my driving directions… everything that driving entails. A real musician must relate to technique in the same way, utilizing the benefits that proper technique brings without spending any of the mental dollar on it. I’m sure I’ll write more on this in the future.